The Pampered Chef Apple Peeler includes a corer and slicer, allowing users to easily prepare apples without having to use a knife and cutting board. The machine is simple to use once you know how to attach your apple and adjust the blade. The blade of the peeler can also be adjusted to cut thin slices of apple to be used for desserts and other recipes. Use fresh and firm apples. Lower the clamp to pull the shaft of the peeler all the way back by turning the red handle counter-clockwise. Loosening the clamp allows you to move the handle, which moves the three-pronged fork. Attach your apple, stem first, to the three-prong fork. Apply pressure to the apple so that it is fully secure onto the fork. You should also make sure that the apple is centered and not lopsided. Turn the red handle clockwise to move the apple towards the peeling blade. Continue turning at a slow rate to peel off the skin of your apple. Stop turning the handle and remove the blade if the apple skin gets clogged in the blade. Clean off the blade with a cloth to remove the excess skin. 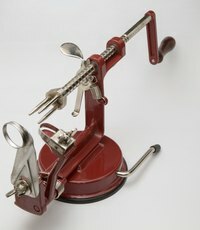 Adjust the wing nut at the bottom of the peeler machine to adjust the blade of the peeler for larger or smaller apples. Tighten the wing nut for a thinner cut from the blade and loosen it for a deeper cut. Remove the core by pulling down on the clamp while turning the red hand back towards you counter-clockwise. Grasp the core with your fingertips and pull it off if it still remains on the three-prong fork. Be care not to touch the prongs if you need to remove the core manually. What Is a Mandolin Slicer?